The stone steps led down into the earth. We entered silently, senses wide open. 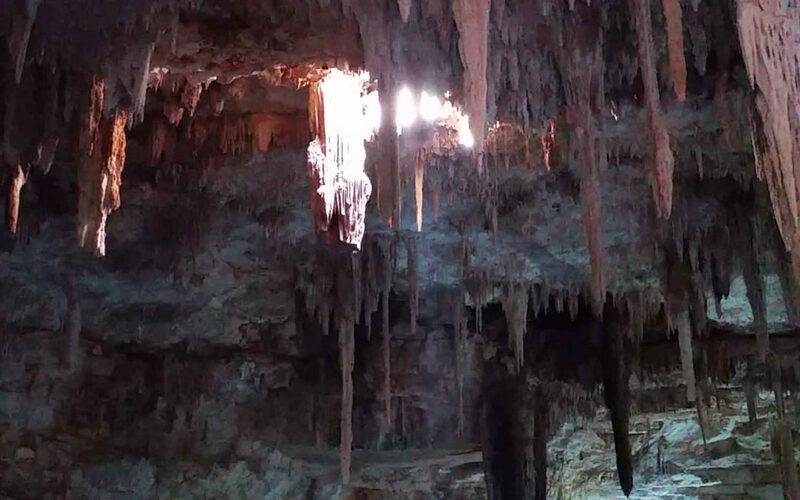 Eyes adjusting to the dark cavern, ears perceiving the hushed echo of a large hollow space, spidey senses tingling as the cenote revealed itself gradually. Several stories below was the dark blue water surface, illuminated by a few electric lights which had been turned on for our benefit. Quietly, we descended the wide stairs along the humid cave wall, in awe of this womb of the Earth. Each person in turn stood silently at the water’s edge, absorbing the space through every pore, before slipping quietly into the still pool. I swam out and turned on my back. 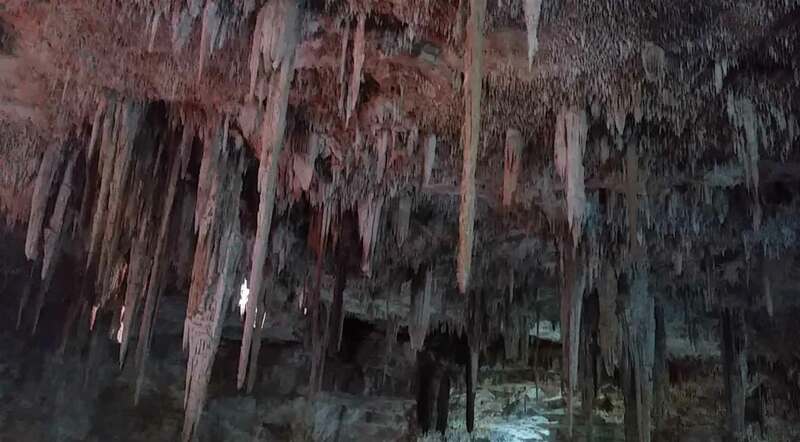 Above me, a thousand stalactites pointed to the unknown depths. One hung low enough to nearly touch the surface. The portal we had entered was high above us, at the top of several flights of freeform limestone steps. 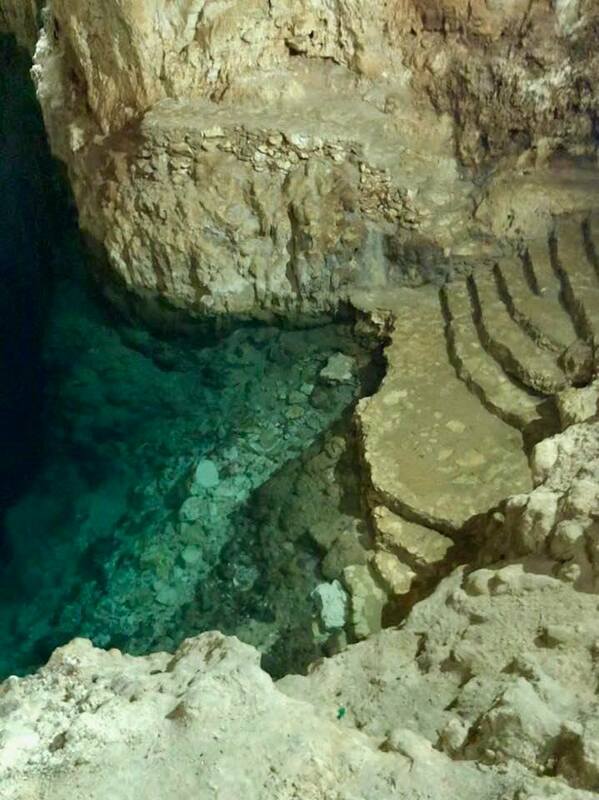 There was a smaller opening to the surface in the middle of the pool, just wide enough for a person to fall through, scrape skin against the stalactites on the way down, and hit the water surface 50 meters below. 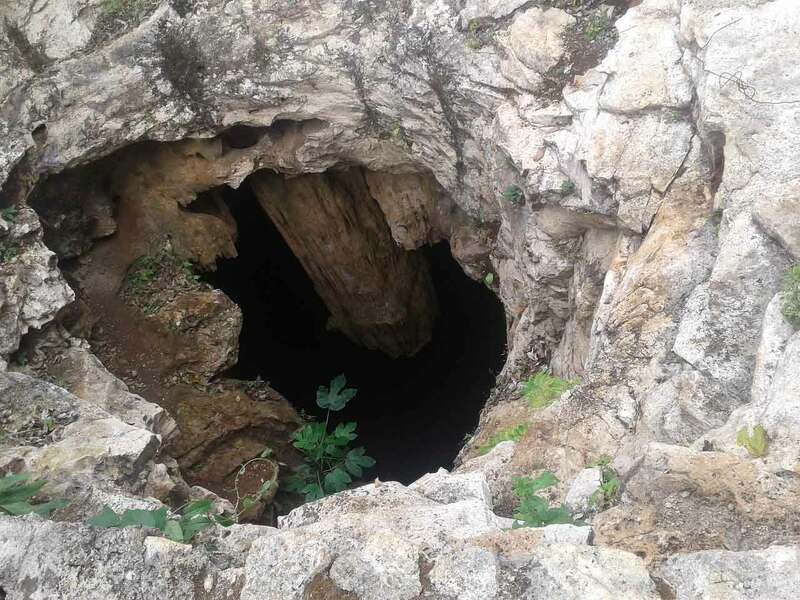 Even if you survived the dive, if it were not for the steps carved in the rock up to the other entrance you might never get out. I floated beneath this alternative portal, watching the clouds drift against the bright morning sky. After a few minutes, I thought, “I can look at the sky almost any day. 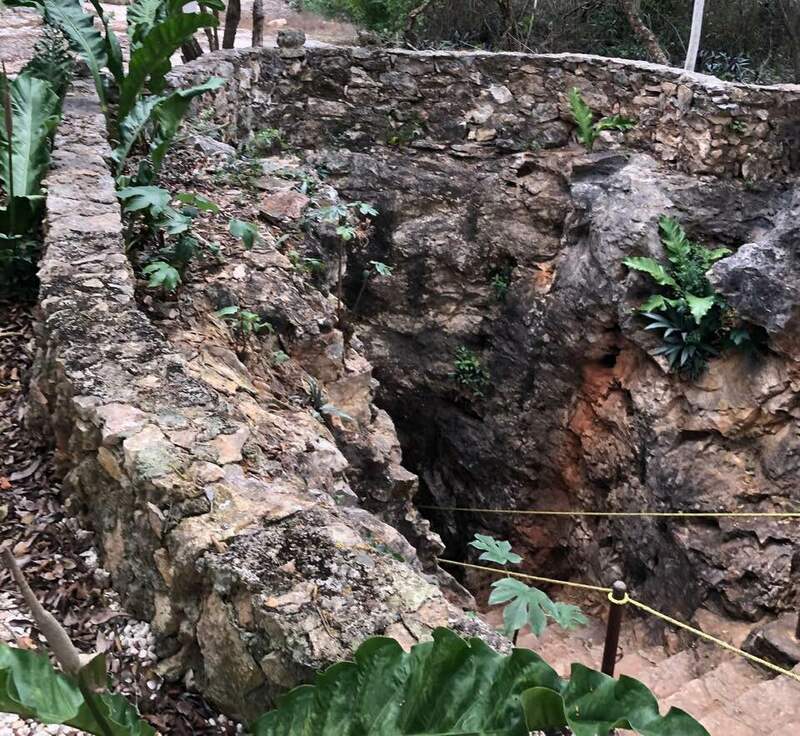 I want to be here now in this cenote while I can.” I lifted my head and looked around again at the formations on the limestone walls. But the bright opening had left a big yellow blotch in my vision, and until it cleared from my retina, I could not perceive the details I had seen before. A juicy metaphor came to mind. If you look only at the light, you will not see the complex interplay of light and shadow that makes up our world. Staring at the light – or the Light, if you will – seeing only what is brightest and disregarding anything less, you may trip over rocks in your path – as long as you have a physical body, that is. You could trip over your own emotional shadows too, because they block your vision. And in relationships, seeing only the light in others can lead to missing the warning signs – of abuse, for example. As long as we have physical and emotional bodies, we need our night vision to navigate our world. I continued to swim and climb on the rocks around the pool, taking in the vast space, until I noticed light dancing on the far rock wall. 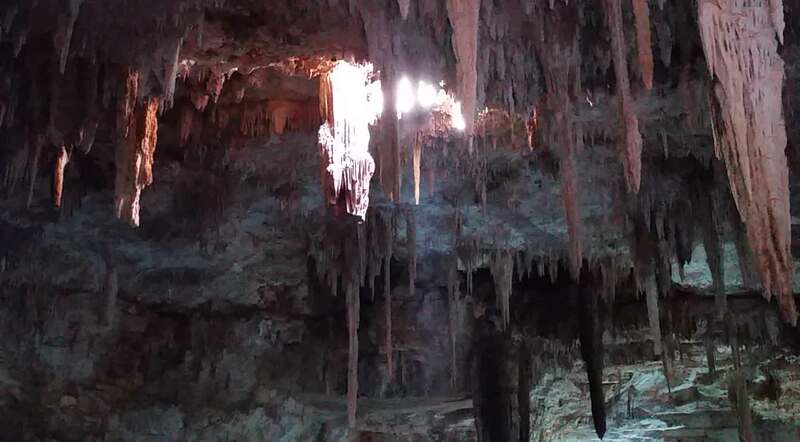 The sun had risen high enough to shine through the small roof opening, and its light was being reflected off the surface of the water onto the cave wall. The languid ripples in the water created by our movements was creating the dance of the reflected light. It was mesmerizing. One of our travelling group’s leaders uses “Dancing Light” as her spiritual name. She had stayed behind that morning. Evidently, she was there in spirit. Again, I found meaning through metaphor. The reflected light did not tire the eyes. Rather, it drew the gaze away from the direct sunlight. If you think of the sun as representing Infinite Source (a.k.a. Creator, God/ess, All-That-Is etc. ), whose vastness and brightness is overwhelming to human minds and eyes, the same Source as reflected in individual beings holds infinite variety and interest. By producing phenomena, the Infinite expands infinitely. The dance of the light was created by our actions in the water. If we had not been swimming around, creating ripples, the reflected light would have been an undifferentiated blob. Likewise, what fascinates us in the physical world – the dance of our lives, is created by us interacting with other reflections of source energy, which we are, all of us. The dance is a product of source light being scattered by our own actions. If we weren’t here, there would be no dance. There would only be one light, undifferentiated. But because it is scattered by our own movement, there is a dance. Which came first? The dance, or us? The scattering of light to create the dance, or the dancers who scatter the light? The question is moot, because time is just a parameter of our physical universe required to allow us to experience things with dense physical bodies. We create the dance and identify with it, so mesmerized that we forget where we come from. Without the dancers, there is no dance of the light. Without the scattering of the light, there is nothing to look at, and no one to look. And then in a moment, the dancing light disappeared. The sun had moved on. 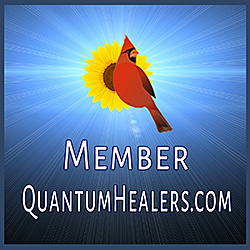 Heather Holm is a QHHT and BQH practitioner. Find her at www.heatherholm.ca.